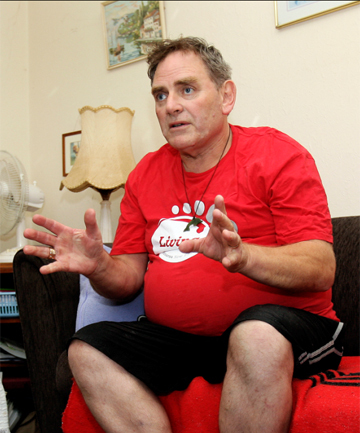 STRUGGLE STREET: John Ryall says there are thousands of people like minimum wage earner Tony Hunt, pictured. Last week the Dominion Post featured the story of 53-year-old Tony Hunt, a caregiver on the minimum wage, who said the newly announced increase of $8 after tax would not change his life of "struggle". Tony loves his job caring for young and older people with disabilities. Some days are hard but that's part of the job. What he doesn't like is the very low pay. The minimum wage increase of 25 cents an hour has been widely condemned. But the Government argues that minimum wage workers are mainly young people, briefly on the lowest rates, on their way to higher paying work. They say a greater increase would cost thousands of jobs and drive employers out of business. Anyone would agree Tony's work is important and requires special skills. So, is he a new start, who can expect pay rises as he gains experience? Tony has five years' experience caring for people with disabilities and 19 years as a hospital orderly. Would paying Tony a fair wage result in job losses? No. His work is essential. Is the minimum wage enough for him to survive? No. Tony and his wife, a former caregiver who cannot work as a result of an accident, are in a life of constant struggle. There are thousands of Tonys on Struggle Street. Child poverty statistics and foodbanks tell the same story. Increasingly, working households can't make ends meet on very low wages. One in five households with children in poverty has at least one fulltime worker. This creates massive costs in health and education, crime, weakening local economies and crippling household debts. Where once we could have assumed government accepted responsibility for this, now the tab is being picked up by communities. This alone is justification for significantly lifting the minimum wage. But, although the Government seems happy to subsidise corporate profits, they have absolved themselves of responsibility for ensuring that the minimum wage will keep workers and their families out of poverty. A year ago our union began talking with the community about a response to low wages and poverty in New Zealand. Living Wage Aotearoa New Zealand has brought together community organisations, churches, unions and ordinary New Zealanders who share a concern about poverty and inequality, and have united to call for a living wage to address this. A report prepared by Peter King and Charles Waldegrave, of the Family Centre Social Policy Research Unit, identifies the New Zealand living wage as $18.40. A living wage is defined as: "the income necessary to provide workers and their families with the basic necessities of life. A living wage will enable workers to live with dignity and to participate as active citizens in society". With the living wage figure on the table, Living Wage Aotearoa New Zealand has called on large employers and local and central government to lead the way and pay a living wage. Small businesses are being asked to endorse the principle and take steps to implement a living wage. Immediately, local businesses like printing firm Thames Publications saw the benefits of being a living wage employer and Wellington cafe chain Kapai committed to taking the necessary steps. The Wellington mayor was quick to endorse the principle of a living wage city and to signal a willingness to explore the benefits. Why wouldn't the Coolest Little Capital in the World want to add "Living Wage City" to the attractive labels of Fair Trade and Nuclear Free? It's worked well for London and many other cities. There is a vast volume of international research from Baltimore, to LA, to London, showing that the introduction of a living wage has changed the lives of workers, families and communities, and not only costs less than anticipated but it does not lead to job losses. Paying workers a living wage increases productivity and reduces staff turnover and absenteeism. As Victoria University professor, Morris Altman, argues: "Paying a living wage need not be part of a zero-game; it need not involve income redistribution. Moreover, to the extent that a fall in wages results in an offsetting drop in productivity, as effort inputs fall off, unit cost will not fall as wages and related labour costs drop." The Greater London Council is one of the most high-profile living wage successes. Every year the mayor, whether they are Left or Right, announces the revised London living wage rate, and at the recent Olympics all contracts were tendered on the basis of paying the London living wage. Here, the distance between the minimum and the new living wage is a sign of how far we have drifted from the notion of people receiving a fair day's pay for a fair day's work.